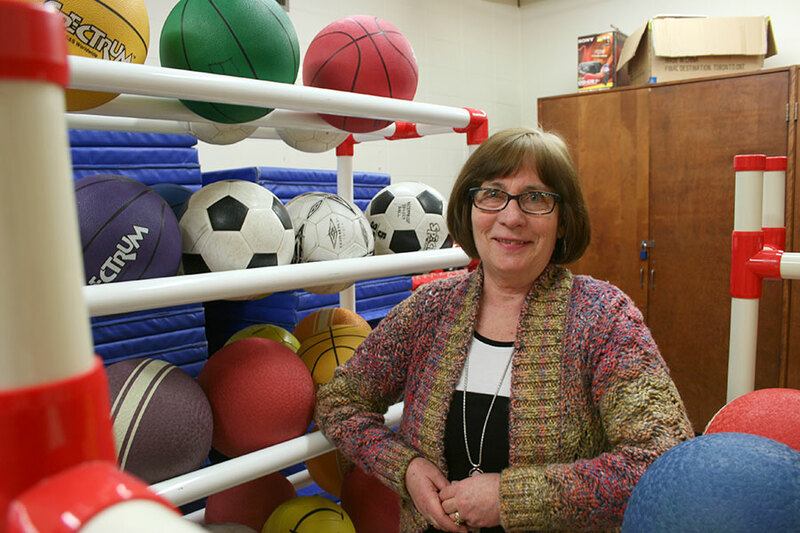 There is much more to physical education than dodgeball, knee-high socks and that dreaded climbing rope, according to education professor Brenda Kalyn. Her class, Methods in Elementary Physical Education, teaches students to take an experiential, holistic approach to elementary-level physical education instruction. The focus is on the whole child and includes progressive skill levels, understanding movement, and spatial and body exploration. Though physical education is often used interchangeably with physical activity, it's important to note that the two are quite different, she said. "Physical education encompasses a body of knowledge as well as a wide variety of activities," said Kalyn, adding that it is critical for "educators to the have a theoretical understanding of the knowledge that is in that discipline, because it is an academic area of study." For example, kids may be able to toss around a Frisbee, but "don't know what kind of throw is needed to execute a good delivery, or how to position their body to successfully catch it." They are all technical pieces of knowledge, she said, that the teacher translates to the student so they can become more proficient in the activity and understand movement. The class has partnerships with local community schools as well as the campus daycare, and all participate in the on-campus activities taught by the pre-service teachers. Over 150 school children have participated this year. The youngsters from daycare delve into the basics of body exploration—how it moves, balances, twists and stretches—while the junior elementary students tackle more refined skills such as skipping, juggling and other fundamental movements, Kalyn explained. If there are any challenges faced by students from different fitness levels, the activities are modified slightly to fit their needs. Likewise, if they show great proficiency in the activity, it is also adjusted to meet their level. "To adapt to all students—that's what teaching is about," said Kalyn. "Ultimately, we want all students to participate in physical education opportunities." The students also learn about games played by Indigenous cultures from Africa, Australia, and North America. The context behind the games is examined, including history, equipment used and the skills developed as a result of playing the games. She said this gives students and teachers alike an idea of what early physical education might have looked like from an Indigenous perspective. At the culmination of the class, pre-service teachers travel to Hugh Cairns VC School to teach a 30-minute lesson to a grade of their choice. Activities are chosen by the teachers and can vary, "so long as it fits the curriculum and is developmentally appropriate for the students," added Kalyn. The lessons are recorded and pre-service teachers get feedback. "They get a real sense of what that 30 minutes of instruction in physical education feels like," she said. Kalyn's goal is for her students to become effective physical education teachers, and pass the quality instruction along to their future students. "It's not just about running, jumping and making lots of noise. It's about the joy of movement, learning skills and applying this knowledge to a lifetime of physical activity for enjoyment and wellness."